Each Service Agent is trained to follow a boat detailing procedure which respects the environment during the cleaning process. Whenever possible we avoid the use of harsh, toxic cleaning products completely and those products we use conform to worldwide environmental regulations and are ecologically safe with a neutral pH, phosphate free and non-pollutants. They are heavily diluted when washed off and are biodegradable. We try to minimise the quantities of cleaning products used. Water is a precious resource often taken for granted. We don’t. Whenever feasible we use high pressure washes using approximately 450 litres of water per hour at 1800 psi (pounds per square inch). This compares to a garden hose, which uses 3500 litres of water an hour, and produces just 58 psi. We also turn off taps and hoses when not in use and fit trigger operated spray guns to our hoses to prevent wastage. 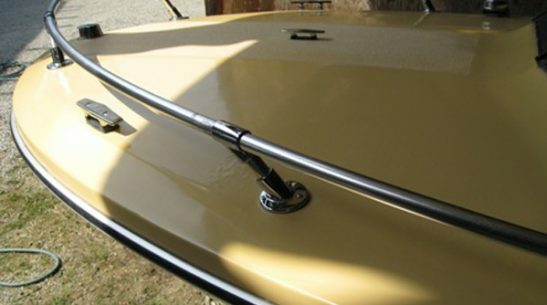 By utilising Pro Boat Clean’s professional boat cleaning services, you don’t need to clean your boat so often yourself, saving water and being kinder to the environment. We are proud to recycle product containers, paper/cardboard, equipment and other items rather than dump them in the garbage. In our offices we try to print as little as possible. When we do, we use recycled paper and guarantee that none of our printer cartridges will go to a landfill. We meet our regulatory requirements and, where possible, go beyond them. We promote environmental improvements by working together with employees, suppliers, regulators, industry and the public. We try to conserve natural resources and minimize the environmental impact of waste and energy consumption by encouraging our employees, suppliers and customers to Reduce, Reuse and Recycle. We communicate the results of our environmental performance internally and externally.